Movie-accurate down to the smallest detail and fully sanctioned by Universal Studios, this is a 1:1 scale model (measures approximately 28" x 8" x 3"). 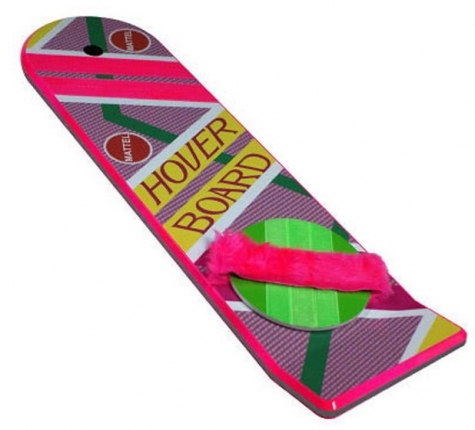 Our Hoverboard includes authentic "whooshing" sounds sampled directly from the films and a deco featuring Mattel logos just like in the films. And although full hovering technology isn't expected until 2015, be assured your Hoverboard will gently glide over most level surfaces (it will not, however, work on water). This is a kind of skateboard or electric hoverboard? How much is it, by the way. Is this like electric moped and how they should be done for this future hoverboard.